The rest are images. They are all labeled under WGD. On this page you will find out about upcoming events that Big G's will be hosting at our restaurant or at other venues. We will also mention different specials, deals, or opportunities that all our customers can take advantage of. Expect to hear from us at least once a month. 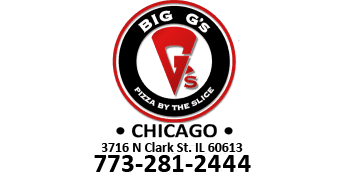 We look forward to serving you the best pizza Chicago has to offer! $5 from every "Pride Pizza" purchased ($25 retail) from June 28 through July 3 will be donated directly to the Howard Brown Health Center (http://www.howardbrown.org/default.asp). The "Pride Pizza" consists of a six slice variety pie, with all ingredients adding delicious and unique flavors that coincides with the colors found in the Rainbow Flag. Pepperoni (red), buffalo chicken (orange), pineapple (yellow), spinach and green peppers (green), buffalo chicken and bleu cheese (blue), and kalamatta olives with red onions (purple)slices make up this delectable 20" pie. We are a bunch of creative and adventurous pizza engineers that simply wanted to make gourmet pizzas for the people in Chicago. Stop on by after a Cubs game for one of our many delicious slices of pizza! "Everyone was super friendly and above all the pizza was amazing! There were sooo many choices that sounded sooo good, my friends and I had to buy four and share! The one slice had my soo full. My experience was all around awesome!" "Stopped here one night because I was starving and a friend suggested it. I don't have one bad thing to say about it. The food was awesome, exactly what I came in expecting to get. Lots of options. I think I spent $4 and left feeling completely satisfied. The guy working... Jeranamo, or however you'd spell that was super friendly and seemed to care about our opinions of the place and the pizza. Will definitely be going back. Probably right now." I visited this place and came away wanting more. They have a delicious diverse menu and you can even get salads. The pizza is very good and you can try a different variation every week. My favorites are the savage, nachos, and mac & cheese. Can't go wrong with the prices as they are very reasonable. "Great pizza, great service in a cozy comfortable setting. My family will be life long customers."